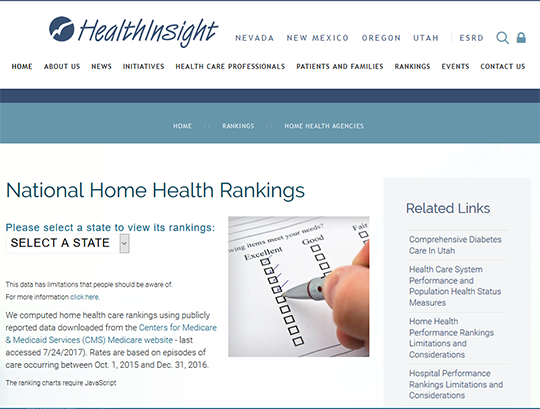 National Home Health Rankings provides national rankings for home health agencies calculated using publicly reported data downloaded from the Centers for Medicare & Medicaid Services (CMS) Home Health Compare website, including quality of care and patient experience. The Home Health Compare data set contains agency-specific performance on 16 quality measures for over 12,000 agencies nationwide. The quality measures show how often home health agencies gave recommended care or treatments that research has shown gets the best results for patients (process of care measures), how often patients improved in certain important areas of care (improvement measures), and how often patients needed unplanned medical care or had to be admitted to the hospital (utilization measures). Agencies are ranked based on their average performance rate for the measures reported.